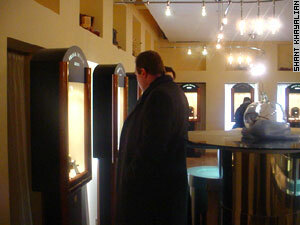 A leading name in high-end watch making has chosen Abovian Street in Yerevan as home for its latest regional boutique. Last month the Franck Muller company of Switzerland opened in what had been the Moscow restaurant on Charles Aznavour Square. In a country where it would take several years of an official average income to afford one of the pricey timepieces, it might seem a risky venture for the major company. "In the beginning we supposed that Armenia, being a trade crossroad for Iran, Turkey and Russia will provide us with a large market," said Muller, on hand for the launch of the new store. "However, returning to Armenia after a four-year break I think that we will have many customers here as well, due to economic growth." A large choice of watches and jewelry produced by the company is available for the Armenian customers, with prices that start at about 6000 Swiss Francs (around $4,000 or 2,340,000 drams). Last spring, Swatch opened a boutique in Yerevan, featuring its typically trendy and mid-priced watches, and some speculated that even the commonly-priced brand would have difficulty attracting customers. Never, though, has a company with such prices as Muller attempted business in Armenia. While currently it serves as something of a gallery for curious on-lookers, founders make no secret that their expectations have proved fruitful, as thus far they have had enough local customers as well as just window shoppers. "Those valuing these kind of things and able to afford them were here the next day after it opened," says businessman Armen Hayrapetyan, founder of the Franck Muller shop in Armenia. But Hayrapetyan says the primary goal of the dealership was to bring the franchise rights to Armenia "but not to bigger neighboring states." Hayrapetyan says Iranian and Georgian companies involved in the same business had indicated their interest in cooperation even before the shop was opened. "Availability of this shop will stimulate development of the Armenian's esthetical taste, as far as they will see beautiful watches and jewelry," says Hayrapetyan. "In my opinion the economy in Armenia is growing, which means people earn money and they need ways to spend it on beautiful things. The possibilities for people in Armenia are gradually growing and the tendency of purchasing bad quality products decreases. Attention is paid to beautiful and quality products." Hayrapetyan returned to Armenia in 1995, after working in Russia for seven years. He is Armenia's exclusive distributor for such companies as Samsung, Gillette group and Nike. "The present stable economic situation of our country enables us, businessmen, to cooperate with such big companies as Franck Muller," he says. Besides opening the shop, Franck Muller Company has invested more than $2 million to jewelry, leather processing and agriculture in Armenia. Today, steel watchcases for the company are produced in Armenia, and eight new super modern tool machines using new technologies were imported for this purpose. 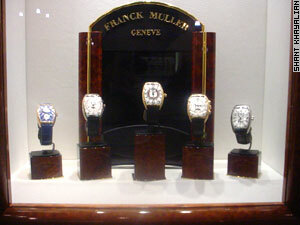 Franck Muller is also a founder of AWI (Armenian Watch Incorporation) company, which sells around 700,000 watches only on the Russian market annually. In December, Armenia became a member of the World Trade Organization, making it possible for labels of "made in Armenia" to go out to 145 markets throughout the world. "Soon companies of this level one by one will express willingness to have such centers in Armenia and this will positively influence our economy," Hayrapetyan says. "Soon we will have a street in Yerevan similar to Place Vendome in Paris and Ginza in Tokyo."